In honor of National AIDS Awareness month, the Museum of Ventura County will host an exhibit, AIDS History and Queer Art, to raise awareness of both the disease’s history in Ventura County and the recent rise in new infections. The exhibit will be on display for the month of October and will feature key pieces from the Gold Coast Archives, the county’s most comprehensive set of LGBTI and HIV/AIDS historical documents and artifacts, now part of the California State University, Channel Islands’ historical papers. AIDS History and Queer Art will be presented in two “chapters” providing both the historical and artistic perspective on the years between 1986, when AIDS Care, Inc. was founded by local gay and lesbian residents to deal with the growing losses in the community, and 1992, the year of growing acceptance and AIDS Care’s first AIDS Walk. Local queer artists’ work will be on display and for sale, including art by Mark Tovar, Miguelito Swank, Glen Heppner, Paul Leighton, Kevin Winger, Neil Coffman-Grey, Stephanie Grey and more. Chapter one, “AIDS Ventura County: The Early Years (1986-1992),” features the local response, detailing in documents, photos and artifacts the years between AIDS Care’s creation and the beginning of greater society’s acceptance of the gay and lesbian community. The Museum of Ventura County is located at 100 East Main St., Ventura and is open Tuesday through Sunday 11 a.m. – 5 p.m. For more information on the exhibit and museum events, visit venturamuseum.org or call (805) 653-0323. 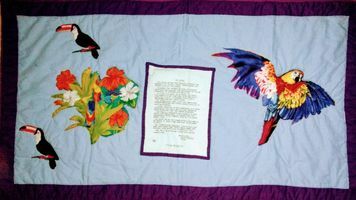 For more information on Quilt Project Gold Coast or the Gold Coast Archives, contact Neil or Keith Coffman-Grey at (805) 569-0561 or coffmangrey@hotmail.com. The Museum of Ventura County celebrates, preserves and interprets the art, history and culture of Ventura County, the California Channel Islands and the surrounding region through its collections, exhibitions, events, educational programs, publications and its research library, and serves as a gathering place for the community. The museum has two locations. The main museum is located at 100 East Main Street, Ventura, CA 93001 and is open Tuesday - Sunday 11 a.m. – 5 p.m., 805-653-0323. The Agriculture Museum is located at 926 Railroad Avenue, Santa Paula, CA 93060 and is open Wednesday – Sunday 10 a.m. – 4 p.m., 805-525-3100. For more information, visit venturamuseum.org .